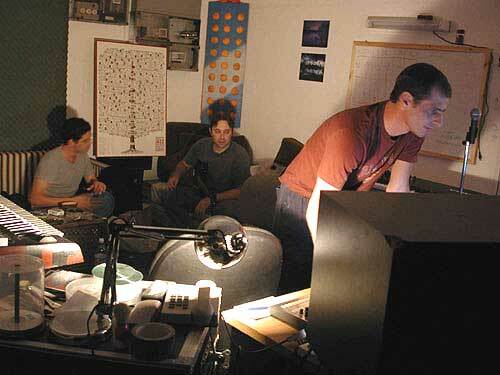 My first encounter with e.om was years ago, in a party in Israel, near a swimming pool, in the middle of an orchard. It was a fine afternoon, sunny, no clouds and spending it dancing by the pool listening to e.om was a lovely experience. e.om were giving a live set, different than any live performance I had seen before. I later met the members of the group on several occasions and now had the opportunity and honor to interview them in their studio, an underground bomb shelter in Ramat HaSharon. Let’s start the interview with introducing you to the world. Who are e.om? Who are you? Ziv Familia - I'm 30, living in Ramat Gan but originally I’m from Ramat HaSharon. I started acquiring my taste in music in the 80s, listening mainly to rock, things like U2, the Smiths, and Brian Ferry and slowly switching to blues and jazz. From there the way to electronic music was inevitable, and came through dub, chill and freestyle and ended with trance. The love for trance came from parties, but didn't start there. My formal musical education was in Rimon School which I went to for a year. Ezry Keydar - I was born and grew up in Tel Aviv but most of my life I have been an itinerant. Give me a tent somewhere and I'm happy. I spent five years in Varanasi, India studying music, mainly the tabla (Indian percussion). I returned to Israel from India with the intention of having a live group. I'm 34, started my musical education at the age of eight, studying piano for four year. I wasn't happy with my teachers and left that type of musical education until I was 19 when I started playing guitar and other instruments, mostly percussions. When I was 26 I've found the tabla and it took me deeper into the world of music. When I refer to my musical education I mostly refer to what I've learned in India, in Varanasi; to the classic Indian music. Ido Berger - I'm 33 currently living in Tel Aviv but grew up in Ramat HaSharon, close to where the studio is. I started my music life with Led Zeppelin, Jimmy Page and studied guitar at that period. I learned at Amos Adani’s for a few years and then went to get a music education at Berklee School of Music in Boston, USA, for four years. I used to dismiss any music that wasn't acoustic; I was into jazz at the time, until a friend came from London and brought a jungle tape he recorded from the radio. I started going to parties and got introduced to trance, understanding the vast quantity of groove potential in electronic music. I can say that Tsuyoshi Suzuki is responsible for introducing me to trance, heard him play in a party in Tel Aviv years ago. How did you become a group? How was e.om formed? Ezry - When I came back from India Ido was planning to play in a festival. He heard that I play the tabla and asked me to join. Ido - I was playing with a didgeridoo player at that time and met Ezry. We had one show at the Bereshit festival all three of us. After that show the didgeridoo player left and we were just the two of us. Ziv - I knew Ido. 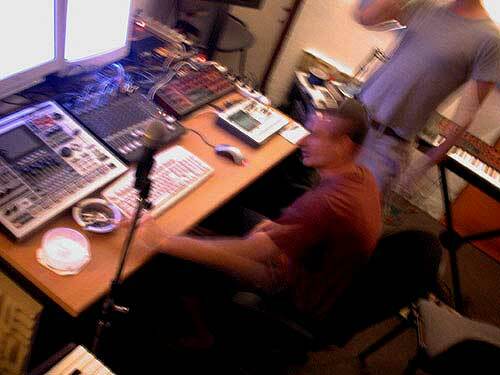 I was making music at that time, Ido was making music too. One day he offered me to join and this is how it started. At the beginning there was another guy with us, David Davidov, who came with a soundman's orientation and we worked with him for about a year. All we used to do at the beginning was play live, learn the tools and the work, playing with drum machines, samplers, keyboards, etc. We didn't work with a computer to make our music, just jamming and playing live with the instruments. Where does the name e.om come from? Does it have a meaning? Ezry - well, we were supposed to have a show in a festival and they needed a name for the flyers or something. Somehow the name came up and we took it. Everyone is welcome to find his own private meaning to the name, his own interpretation. Some refer to it as and abbreviation for electric om. Ido - I think it came from the fact that we were working a lot with the tabla, bringing in the Indian om. Kind of a mixture between east and west. Actually I liked another name Ezry has offered much more - Superman Olympus. Ziv - When I joined they already had the name. They told me the name and where to sit in the room. We are here in your studio, what can you tell me about it? Ezry - this is a bomb shelter we are let to use by the municipality. We have keyboards, samplers, drum machines, speakers; everything we need is in here. Ziv - at the beginning we combined all the personal equipment we had together for the studio. Everything here we bought with a live act in our mind, since we were playing almost just live at that time. 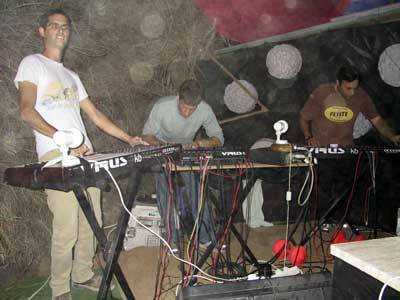 Ezry - Nowadays, when we go somewhere to play live, we take almost all our studio out. Almost everything but the computer. Ziv - I think that since we started working in the studio and not just play live, our sound has improved remarkably. Our studio work has improved as well. I think this improvement is also important for and reflects on our live performances. The current problem is that none of us had a lot of knowledge about sound production, and in many cases you have to do that yourself to get the desired output. We had always given others that job, and it caused lots of problems. You have to do most of it yourself. How do you create music? How does the process of creating a track start? Ezry - In general we all do everything around here. Ziv is a master with everything concerning sequencers, drum machines and all that stuff. I do most of the computer maintenance. Ziv - instruments-wise we each have his specialty. Guitars are more of Ido and my thing, Ezry does the tabla. Ido - My job is to come every once-in-a-while and shout that we need to start all over again. I'm always unhappy and want to throw everything away and start afresh. Ezry - we don't work each on his own tool, we work together. In live acts too, we all do everything. And the actual process of creating a track? Ziv - it always starts with an idea, a concept. Ido - one of us finds a sample, a groove, a bass line he likes. Ezry - since working on a track is to take a small fracture and dive into it then each takes his idea wherever he wants. When the idea becomes a concept he starts showing it to the others for feedbacks and mutual work. Then we all share inputs, adding sounds, mixing, anything. Ido - we give some friends samples to listen to what we do sometimes, get external opinions, but we try to sort the advices and feedbacks we take. A person's opinion is very subjective, influenced by the moment, by so many factors. It really depends who is giving the advice and feedback and how he does that. If we start changing our music each time someone says something we will never finish a tack. Ezry - but you have to admit that sometimes someone gives you a feedback that makes you look differently at something. Sometimes it can send you back to the studio with a whole new insight of the track. Are you working on a CD? Are we expected to see a release anytime soon? Ido - One of the problems we encountered since we work mainly on live performances is that we do not have any released material, nothing that can be released. Once you improvise everything on stage, you don't have anything real left. This is one of the main reasons we work mainly in the studio these days and concentrate on that. We consider ourselves as a jazz trio with non conventional instruments, but when you create a track with a live performance orientation, it is just not the same as a track you create for a CD. Ezry - we have contacted several labels with demos of our music, in Israel and elsewhere and the feedbacks are very positive so far. Unfortunately nowadays you have to have a CD, that plastic thing, to get recognition. It is not our highest and most important goal, but it has become a marketing must. A CD is sort of a tag, without which you get no recognition; even on IsraTrance forum you won’t get an artist status without it. So we follow the conception of the crowd and society. How do you define your music? What is the style of your trance? Ezry - I don't like all those niches of trance, those different genres. Our CD is not aimed to any of those definitions, not planned to be labeled or automatically associated with any genre known. We allow ourselves to move in two different paths. One is pure psychedelic dance floor originated music and the second is truly going wild, not promising to make anyone dance. Ziv - It is not progressive, not full on, none of those. Ezry - I see trance as a global phenomenon; something that crosses cultures, completely intergalactic. Our music has a lot in common with classic Indian music. Indian music has a sort of trance to it too, more of a spiritual trance, not a physical trance. Ido - I've found that monotony is a wonderful thing, I got really tired of chords and structures, and there is something wonderful in basic tonic harmony. It seems like you aim for live performances. I saw you in one; you talk about it a lot, what is so special about your live performance? Ezry – I consider a performance something that is totally live. There is an added value to music when it is played on the spot, when it is completely live without playback. There is some magic in the direct communication you can have among the players on a live set, and of course, between the players and the audience. A prerecorded set is something completely different. 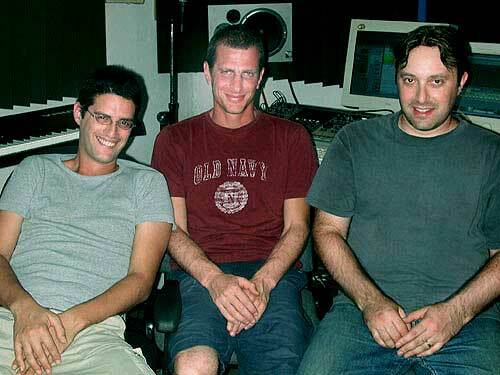 All three of us come from musical improvisation – Ziv and Ido come from the world of jazz and I come from classic Indian music, which is based mainly on improvisations as well. We took that as some basic ideal and we intend on taking it to a place where the music is electronic, but purely improvised with the standard trance instruments. Ido – that’s the ideal, but we have lots of problems we need to solve until we reach that goal. Ezry – most of what we did in the past three years was to try and make this ideal happen. Trying to keep the freedom and magic of improvisation to a party, yet keep the process feasible, technically speaking. 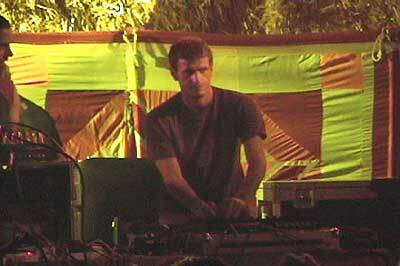 Ziv – There is a big problem that the two concepts, trance and improvisation, kind of collide. In general, trance music is not an improvised thing; most of the electronic music is like not improvised. In trance it is just not a part of the music, improvising. You can’t just come and improvise trance for the crowd. 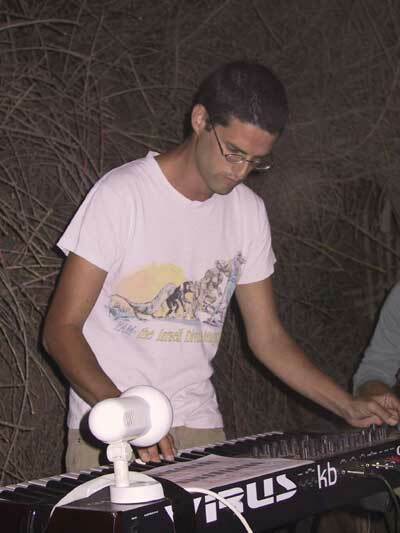 Ido – I think we managed to start and bring improvisation into trance, into our performances. The main problem in parties is that you need lots of equipment on stage and some conditions that are hard to get in parties. Many times we came to a party to play and the basic equipment we asked for was missing, like the number of monitors on stage, and it ruins the whole performance. We always want to justify our being on stage, give the audience what they came to hear, the experience they came for. It requires a lot of communication among us and a lot of patience from the audience. Ezry – the problem is that when you have no feedback from monitors, you can’t really play a proper live. If you can’t hear what you’re doing, you’re doomed to the land of basses. If you rely on what you pre-recorded in the studio you have an easier job, but we don’t do that. Ido – when you do a live performance like that, you literally build the track on stage from nothing; you have to hear what you’re doing and go with the flow of the track. We intentionally didn’t want to have regular instruments on stage; we wanted everything to be electronic, except for the guitar and tabla. We want to play the electronic instruments like regular instruments. In regular live sets the standard instruments, like guitars or drums are the truly “live” part. In our case everything is live; we play the keyboards and machines like they were standard musical instruments. Ezry – what we create here in the studio is the basis for the live performance, the infrastructure of the track. The subject and theme will stay in the live performance, but the track itself will be completely different from what it sounded like back here in the studio or from a recorded copy of it. 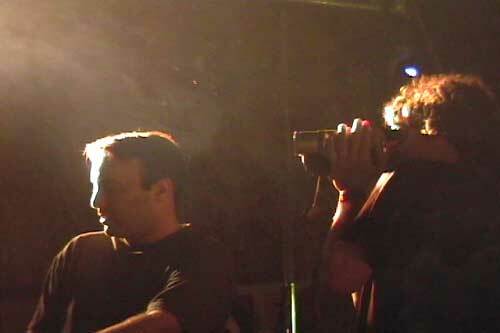 A live performance is a singular interpretation of the track, and therefore will sound differently each time. Do you still go to trance parties? Ezry– when I was in India I didn’t go to any trance party. I went to a few back in 90-92 in Israel, Nitzanim beach and the likes. I still go to parties, but not every weekend. I pick the ones I expect to be good. I never go to clubs, because I don’t like the sound and there is no where to run away. Ziv– I go when Ezry takes me. Ido– I used to go quite a lot but since I got married I kind of stopped. I should start again. We hope for the day that playing in trance parties will cease to be a criminal offense.